Sorry this is coming so late, but I figured better late than never! I'm re-sharing some of my favourite Easter activities from previous years and also sharing some new ones we tried this year! I hope you can use some of these ideas either next week or next year. My kiddos LOVED this centre this year! Each CVC word letter tile and corresponding picture is in a different colour so the tiles/pictures won't get mixed up. I put each set in an Easter egg that is the same colour as well. 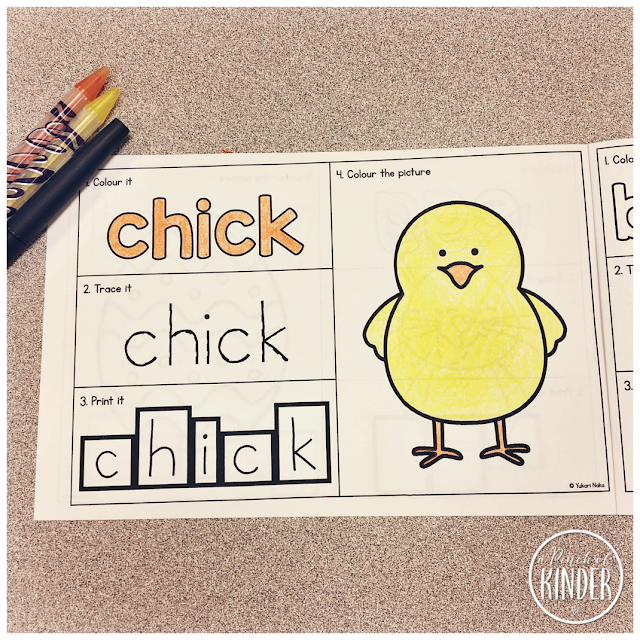 Students open an egg, look for the picture, identify the word, unscramble the letters and write the word on the recording sheet. I though it might be a little bit tricky but even my JK's were rocking it at this centre! 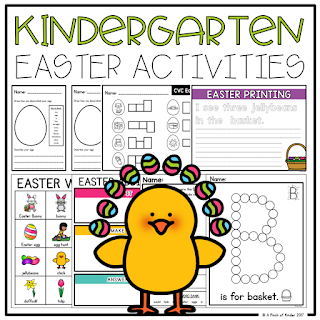 This centre is included in my Kindergarten Easter Activities pack on TpT. 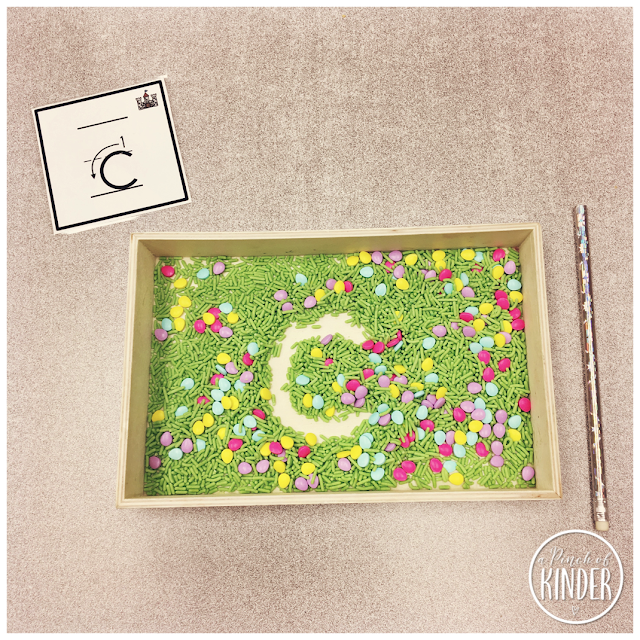 Writing trays are great because they are so versatile! For this tray, I used Wilton Sprinkles - Colorful Egg Mix that I found in the baking section at Walmart. 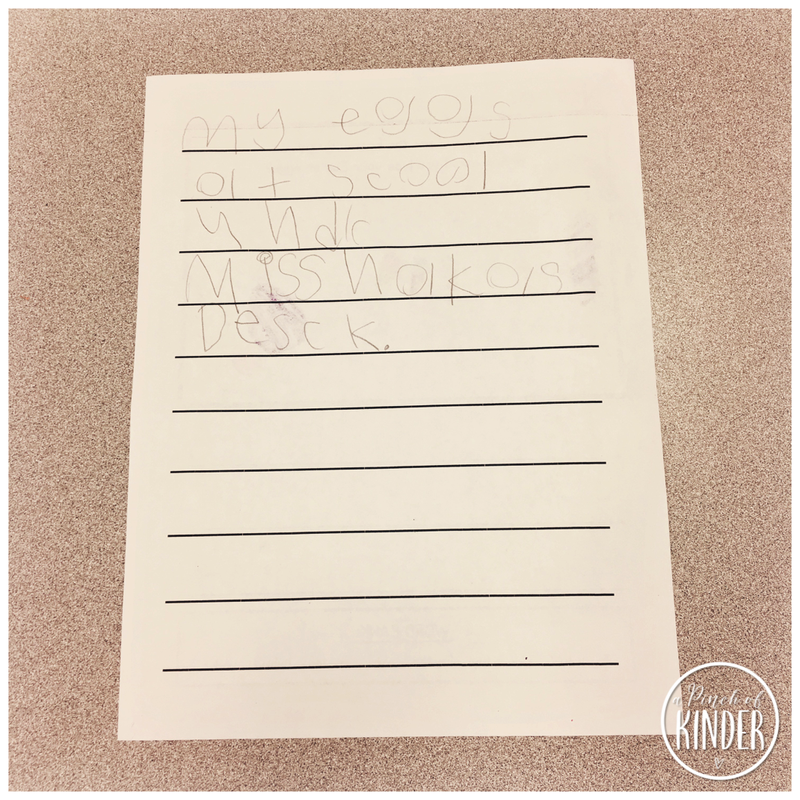 We added letter cards in the mornings and number cards in the afternoons. You can grab these letter cards here. I found this awesome felt Easter egg decorating kit at Dollarama for only $2 and knew I had to have it! So I made this recording sheet to go with it. 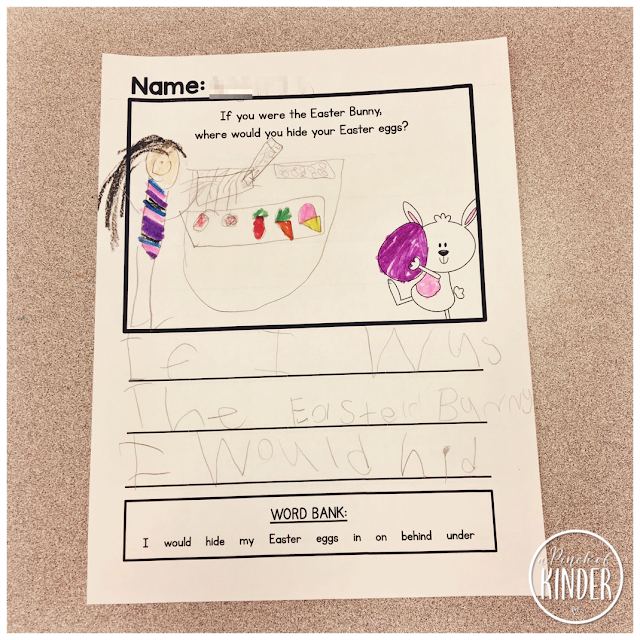 Students were invited to decorate the egg and then record and describe their egg when they were finished. I thought this one might be a little tricky too but my kids did such a great job with it! 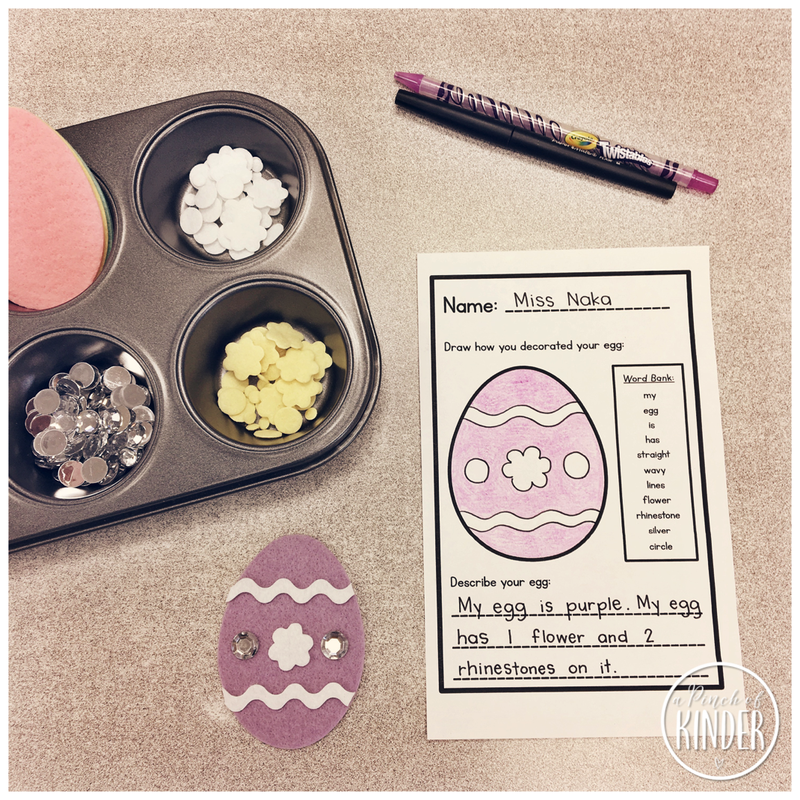 I know not everyone might have the same things in their egg decorating kit so I included an editable version in my Easter activities pack. Or there is an option to decorate the egg right on the paper. 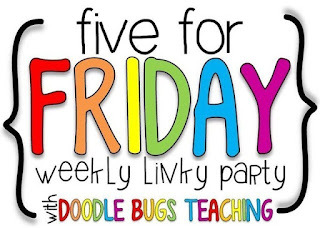 My kids love these thematic books and I love them because almost all of my students can complete them independently. 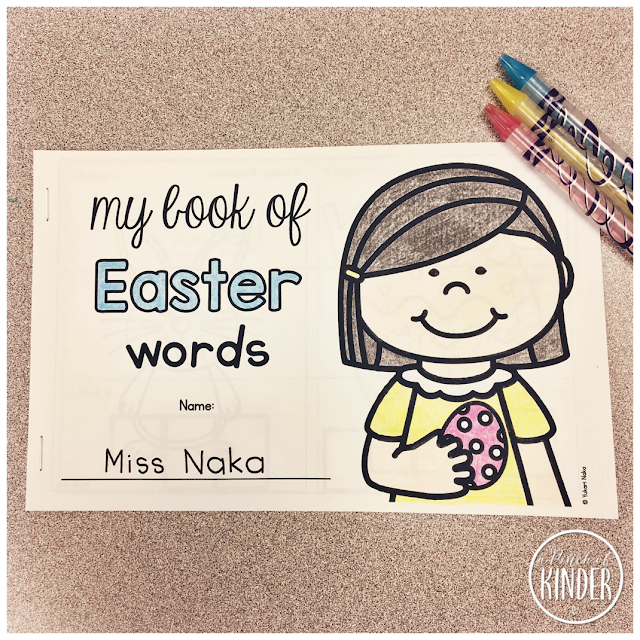 You can grab this Easter word booklet here. I got this idea from Marsha at Differentiated Kindergarten and my kids loved it! 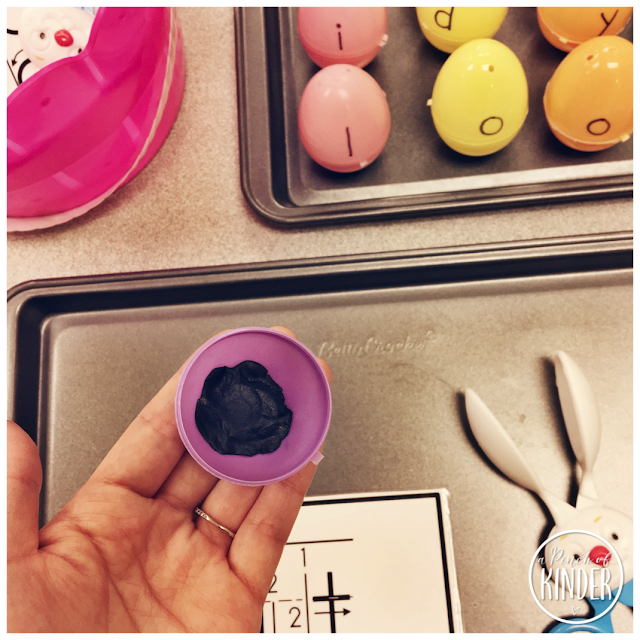 I picked some sight word cards, wrote the letters needed on the eggs and then a magnet in the egg and held it in place with some plasticine. 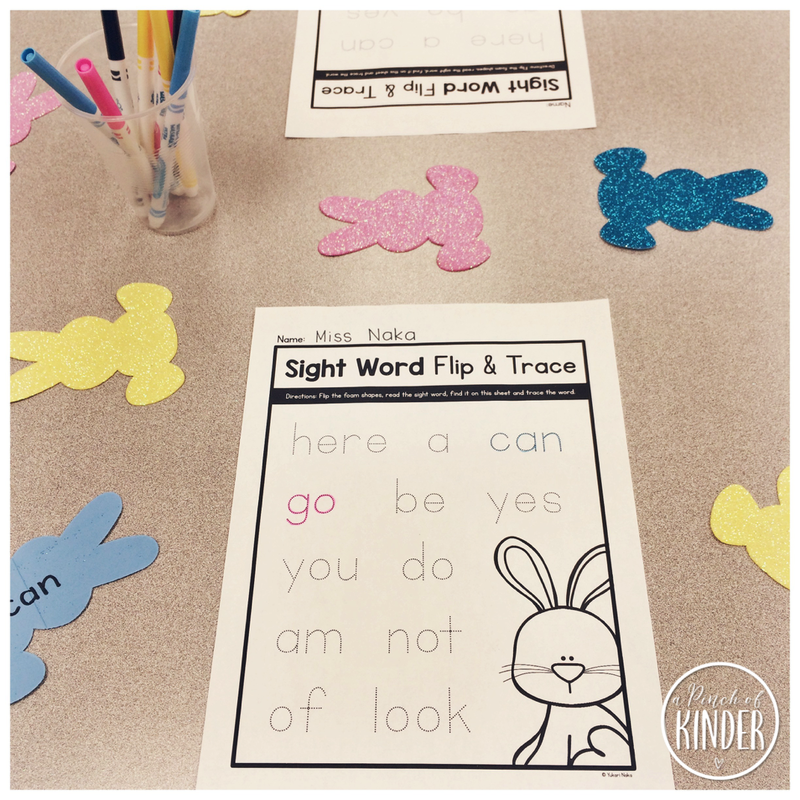 You can grab the sight word cards you see above here. After reading the story "The Littlest Bunny: An Easter Adventure" by Lily Jacobs we prompted the kids to write about where they would hide their eggs if they were the Easter Bunny! They came up with some good ideas! "If I was the Easter Bunny I would hide my eggs at school under Miss Naka's desk." I put this centre out last year and it was a hit this year as well! Students flip the foam shapes, read the sight word, find it on the recording sheet and trace it. The first week (above) I laminated the recording sheet and the students traced with a dry erase marker. The second week (below) we switched to the foam bunnies and I set them out with paper recording sheets and coloured markers that matched the colour of the bunnies. Little changes goes a long way in making an activity seem new again! I grabbed these foam shapes at Dollar Tree. My kids loved this centre again this year! I wrote numbers 1-20 on one half of the eggs and corresponding dots for 1-10 and tally marks for 11-20. 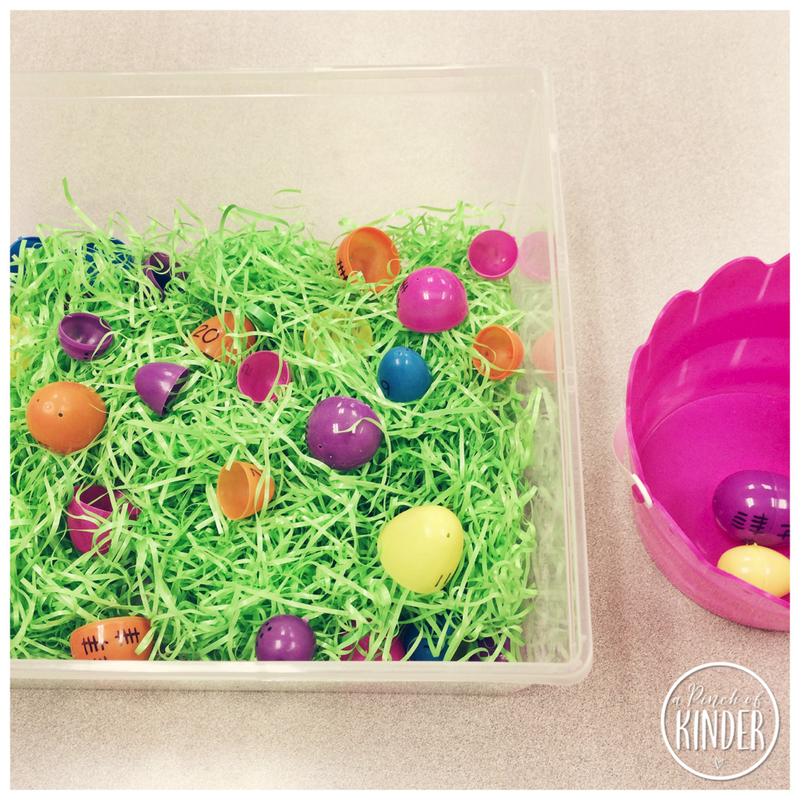 Students dug through the Easter grass, found the matching halves and put them in their baskets. This one was a hit from this year! This is a partner game. The kids take turns rolling the dice (which I made by writing on a small wooden cube) and adding or subtracting that many eggs into or from their tray. The first person to fill their tray is the winner. A lot of my kids need practice differentiating the plus and minus sign so this was perfect for practicing that in a fun way! I wrote +2 (twice), +1 (twice), -1 and -2 on the dice. Remember the felt eggs I used for the "Decorate & Describe" centre I shared above? 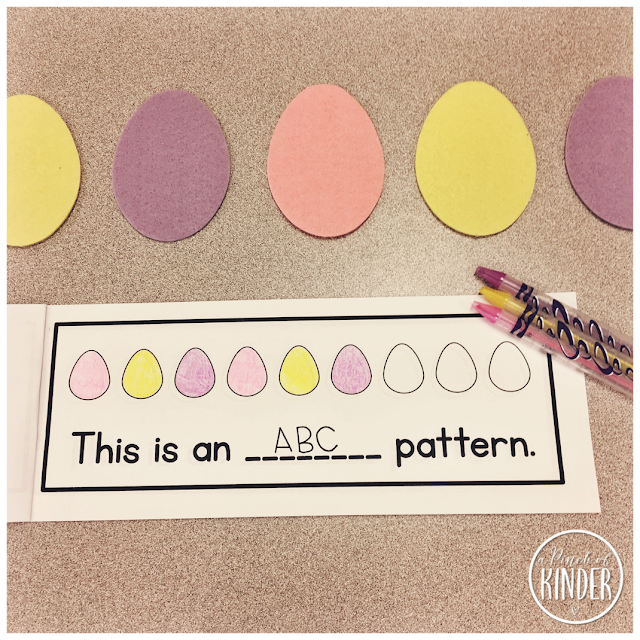 Well Easter egg decorating pack I bought came with a ton of felt Easter eggs so I decided to put them out for patterning! 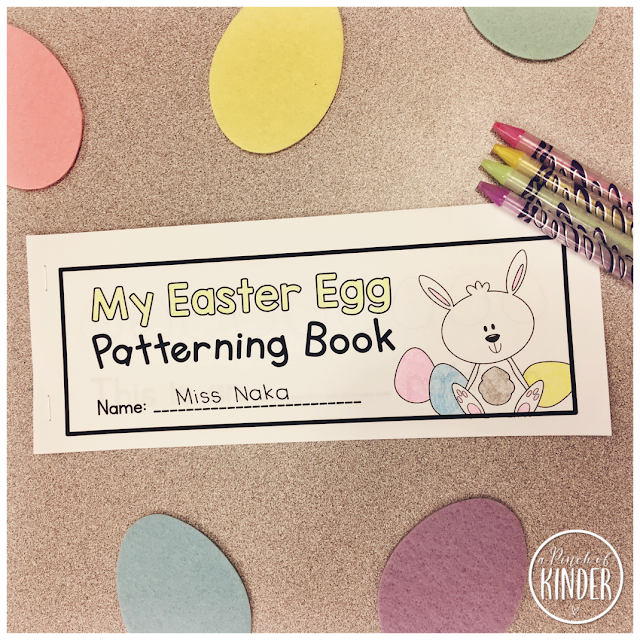 They had the option to record their patterns in these patterning books. 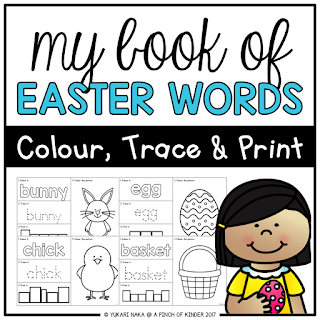 This is also included in my Easter activities pack on TpT. 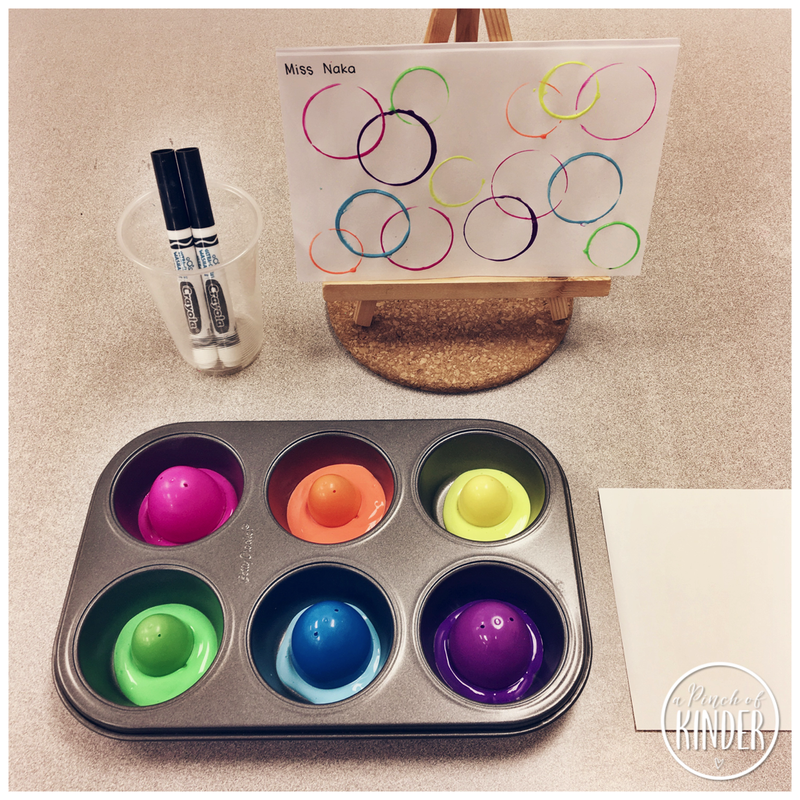 This is another idea I got from Differentiated Kindergarten's April Fine Motor Morning Work Stations blog post. The kids decorate the outline of the Easter egg with stickers and count how many of each kind and how many stickers they used all together and record that at the bottom of the page. I wanted to be able to use most of the stickers so I made a second sheet that has hearts, gems, and bunnies. I bought my sticker book (pictured above) at Wal-Mart. You can grab the printable with the hearts, gems, and bunnies by clicking here or on the image below. The first sheet with eggs, birds and flowers can be download from the blog post mentioned above! 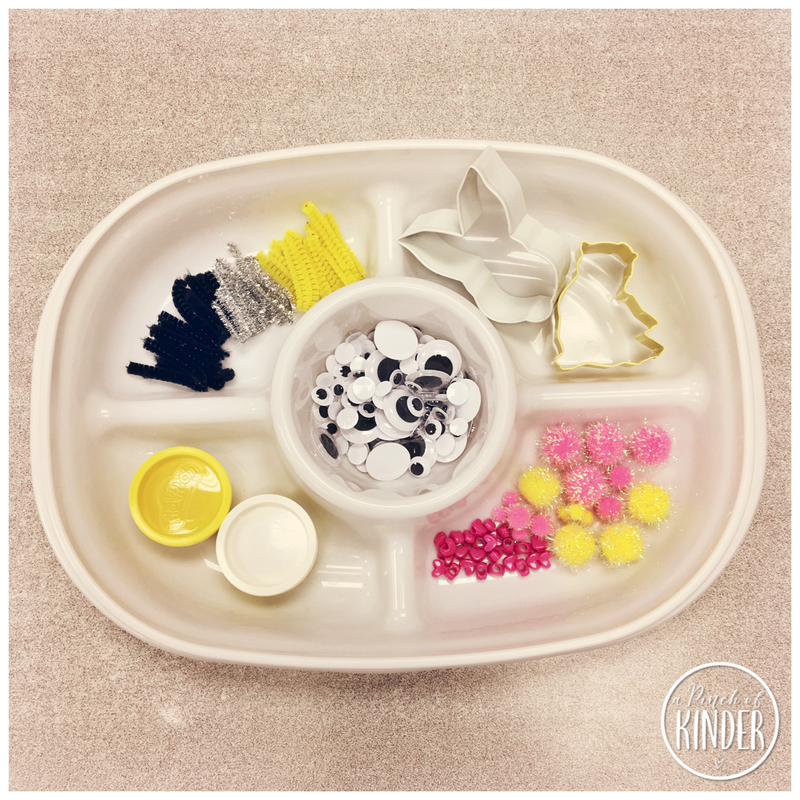 I love setting out play dough with loose parts because it promotes creativity, fine motor development and oral language. The kids enjoyed creating their own chicks and bunnies with the materials provided in this tray! 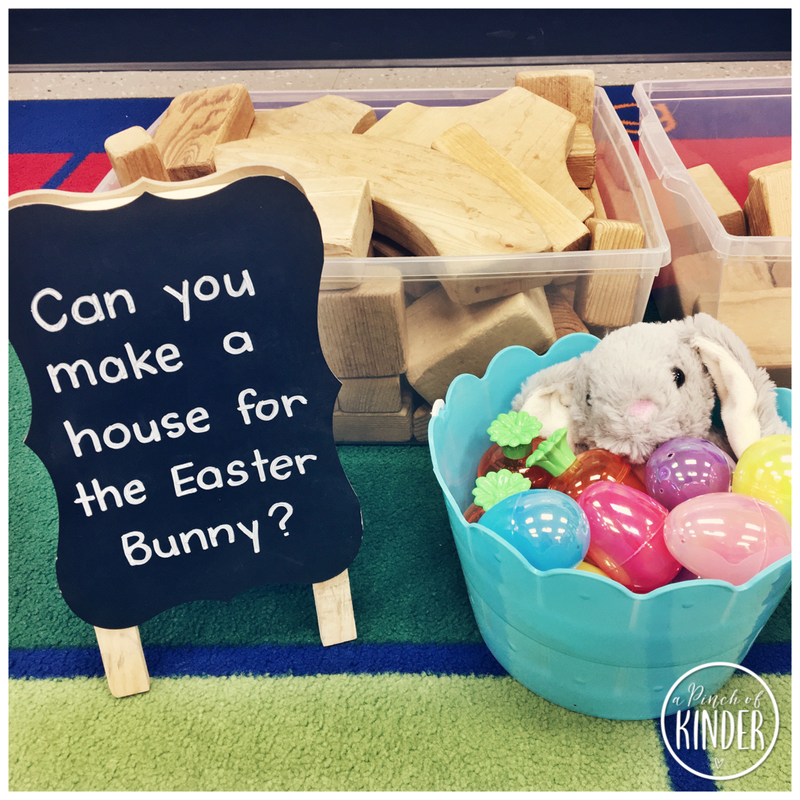 I got this awesome Easter building idea from Pocket of Preschool. The kids loved building a house for the Easter Bunny and engaging in pretend play at the block centre! I set out the invitation to build with a bunny, Easter eggs, carrots and some chicks (not pictured) and flowers (not pictured). This one was a huge hit! Here is another idea I got from Pocket of Preschool. Students were invited to make print art with Easter egg halves and paint. So simple but the kids loved this new way of painting! I hope this post gave you some ideas to use around Easter to engage your kids in learning! 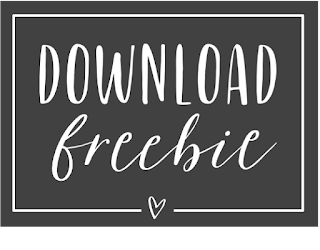 The printables that were not offered as a freebie in this post are all in the pack below. Click here on the image below if you are interested in checking it out! Happy Easter everyone! I hope you have a great long weekend! 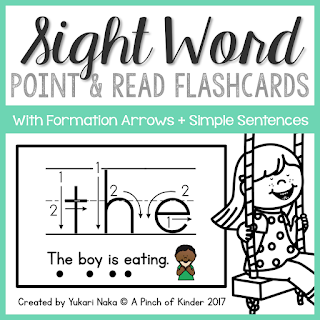 My kids always love these thematic word booklets! 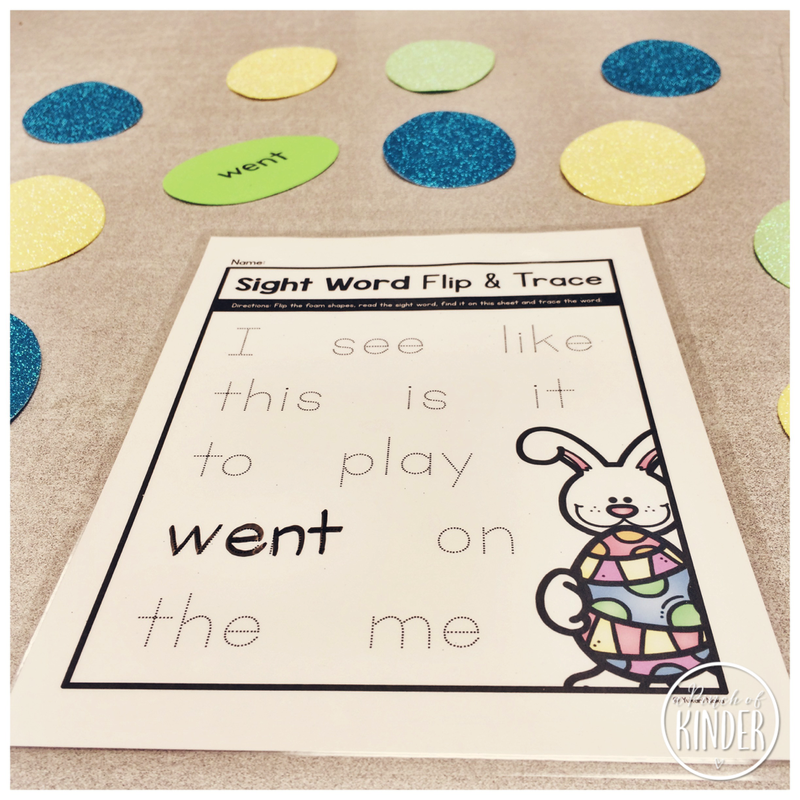 They are simple enough for them to complete independently and a great way to encourage them to work on their printing. I saw this idea on Differentiated Kindergarten's April Fine Motor Morning Work Stations blog post and knew I had to try it too! 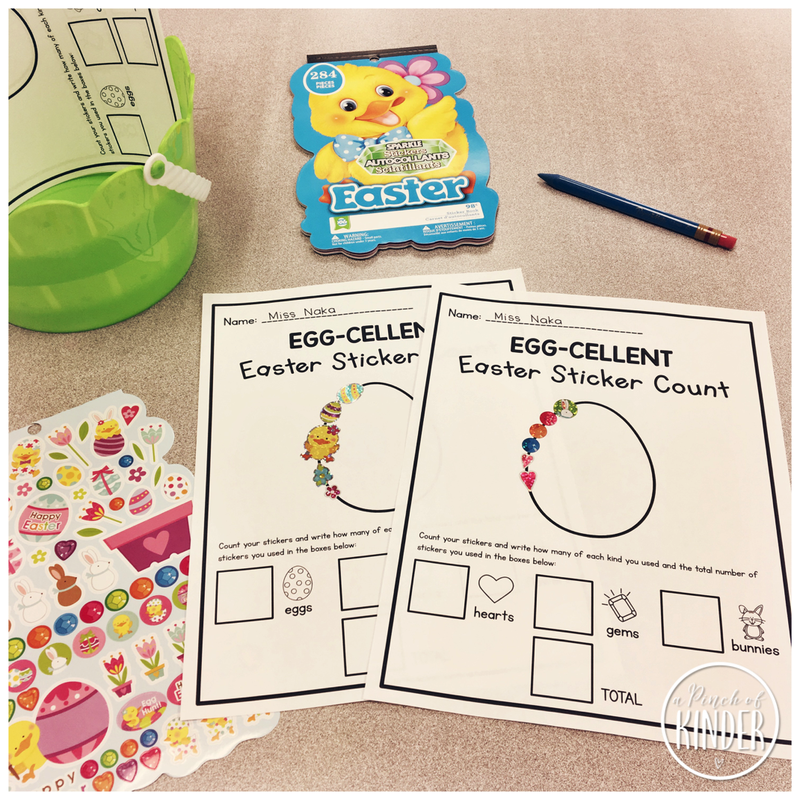 The kids decorate the outline of the easter egg with stickers and count how many of each kind and how many stickers they used all together and record that at the bottom of the page. I wanted to be able to use most of the stickers so I made a second sheet that has hearts, gems and bunnies. I bought my sticker book at Wal-Mart. 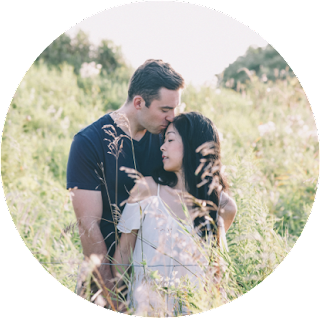 You can grab the printable with the hearts, gems and bunnies by clicking here or on the image below. The first sheet with eggs, birds and flowers can be downloaded from the blog post mentioned above! After we learned addition and subtraction I realized a lot of my kids were mixing up the plus and minus signs! So I came up with this game to help them practice distinguishing them. This is a partner game. Each partner gets an egg tray. 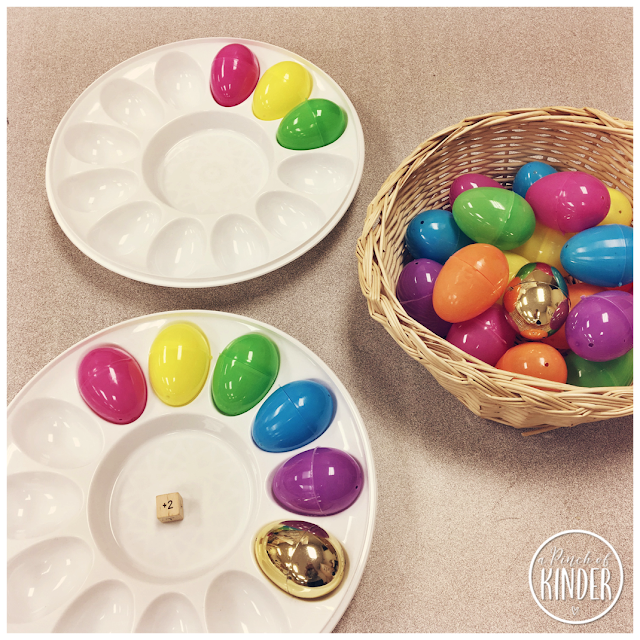 Partners take turns rolling the dice and adding or subtracting that many eggs from the tray. I wrote +1 (twice), +2 (twice), -1 and -2 on a wooden cube to make a custom dice for this game. The first person to fill up the tray is the winner! The kids loved this game and played it over and over! 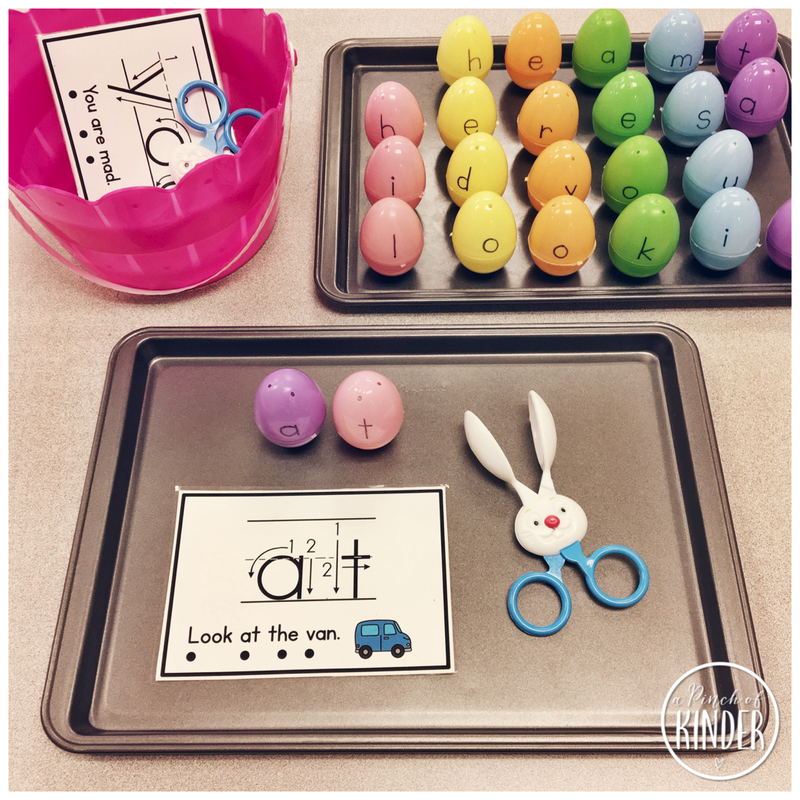 The kids are asked to take a sight word card and use the bunny tongs to grab the eggs they need and build the word. They loved this centre! I bought the bunny tongs at Party City. 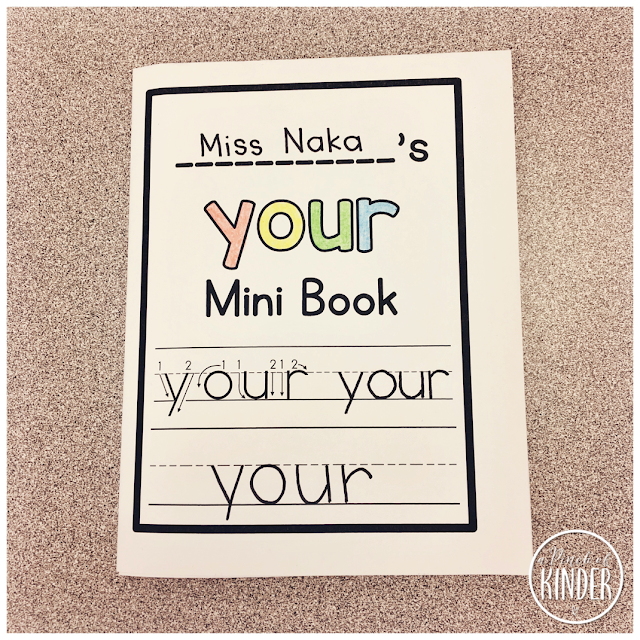 Our sight word this week was "your" so we set out these mini books for them to practice with. On the cover, students write their name, trace the word with their finger, trace the word with a pencil and then write the word on their own. Next, they open up the book and trace "your" on the left hand side and write "your" on the line on the right hand side. 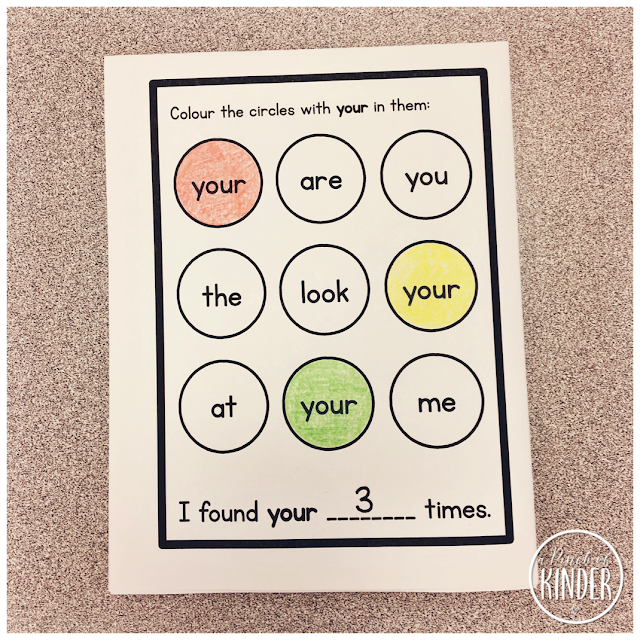 On the last page, they find and colour the circles with "your" in them. Then they count and write how many times they found the focus sight word. 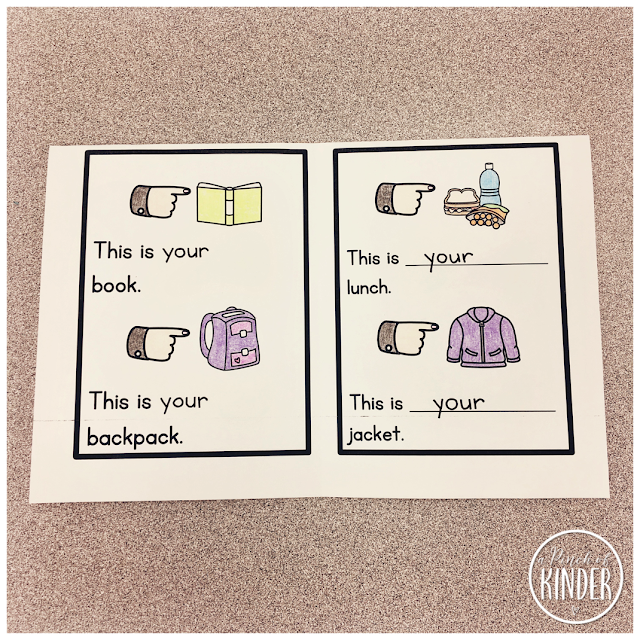 You can grab this printable to use with your class for free! Click here or on the image below to grab it! 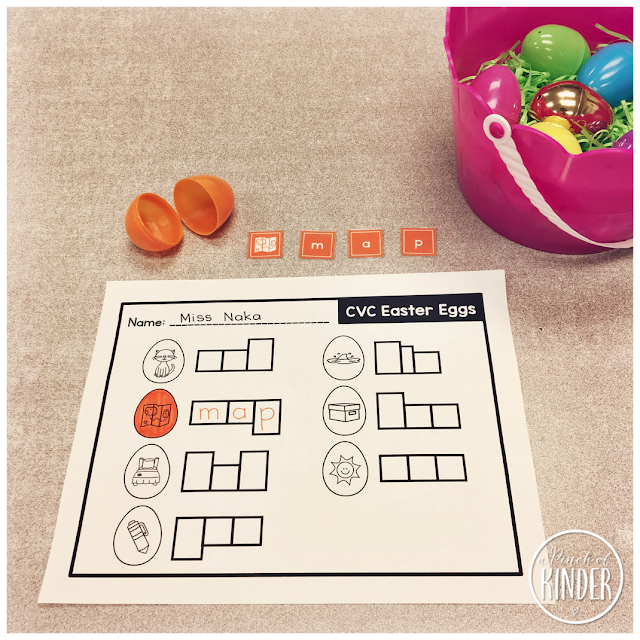 I hope you were able to grab some ideas to use in your classroom! Have a great weekend!